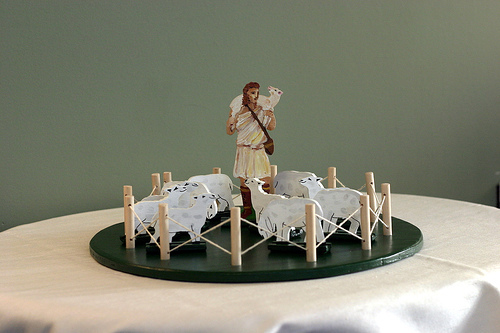 ​What is Catechesis of the Good Shepherd? ​Catechesis of the Good Shepherd is an approach to the spiritual formation of children ages three to 12 that is rooted in the Bible and the Liturgy and uses Montessori’s educational approach to faith formation. The atrium is a specially prepared room just for the children, where they can come to know Jesus, the Good Shepherd. The room is prepared with special materials made by our own catechists. The children work with the materials as a way to meditate on the lesson presented. The materials cover biblical stories as well as liturgical moments. For example, there are maps of Israel, a relief map of the city of Jerusalem to help the children learn about Jesus’ life. There is a baptismal font, a candle, shell, and a white garment to help the children learn about the Sacrament of Baptism. These are just two examples of what is housed in the atrium. The Catechist is the person who facilitates the relationship of the child with God. We are not “teachers;” we are co-learners with the child as we ponder the Scriptures and allow the Holy Spirit to teach. The catechist asks “wondering” questions, so that the child and the adult ponder the Scriptures together. The children come in and work on their own until they are invited to a presentation. The most important time for the child is the time after the presentation. This is their time to ponder what they have heard proclaimed. They may draw, trace, or work with the materials. We end our time with worship. At Level One, the catechist conducts a very simple time of prayer and singing. At the upper levels, the children conduct their own services with Scripture readings, songs, and prayer. All parents of children in the atrium are asked to: 1) bring their children on a consistent basis. 2) Help in the atrium either with materials making/restoring or assisting. 3) If called, to take the training to become a Catechist. The training is given right here at St. Jerome, contact Lisa Reeves for more information about adult formation. ​You do not have to be a parent to help in the atrium or to take the training. We encourage anyone in our parish who would like to draw closer to God to help or train. You will be amazed!